The Lexus GS 350 F Sport delivers panache and performance. 2018 Lexus GS 350 F Sport. The midsize luxury sedan market includes many participants, with every manufacturer offering at least one model. In Lexus’ case, you have a choice of two models: the ES or the GS. The former is front-wheel-drive only, thus its appeal is to a different group of buyer than the one interested in the GS. The GS comes with standard rear-wheel drive and has available all-wheel drive, which appeals to drivers looking for a performance edge. Lexus offers the 2018 GS in GS 300 ($46,510), GS 300 F Sport ($51,100), GS 350 ($50,895) and GS F Sport ($52,260) trims. You can also choose a hybrid model, the GS 450h ($63,635) and GS 450h F Sport ($68,680). Last, but not least is the GS F, a rear-wheel-drive performance model retailing from $84,350. Add $1,025 for the destination charge across the model line. All prices mentioned here are for the rear-wheel-drive versions. Changes for 2018 include renaming the GS 200t the GS 300. The GS 350 and 450h return unchanged. As for the GS F, this model now has full range adaptive cruise control, which means it works at all speeds. Further, lane keep assist is added to the lane departure warning system. Finally, the Lexus Enform Safety Connect and Service Connect telematics systems are now complimentary for 10 years. 1. The F Sport delivers styling and handling edges. Besides the apparent badging changes, what does the F Sport bring to the Lexus GS? The differences are somewhat subtle, but are most apparent beginning with the mesh front grille inserts. From there, you’ll find front bumper and rear lower valence changes. 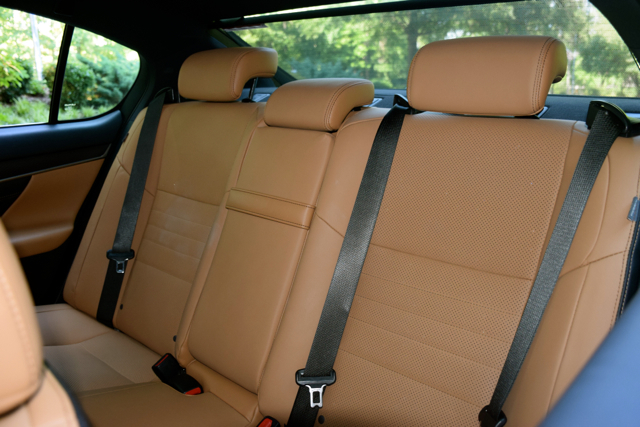 Inside, the cabin has striated aluminum accents, aluminum pedals and door scuff plates, and unique perforated leather trim and a black headliner. On the performance side, the F Sport adds adaptive variable suspension with a sport+ mode. There is no power advantage with the F Sport, however. 2. You get V6-power all the way. 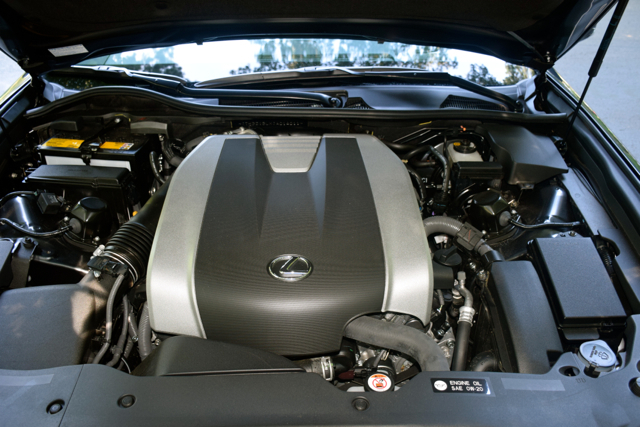 The GS 350 F Sport utilizes a 3.5-liter V6 engine, which is common to numerous Toyota and Lexus products. Thanks to a slight change in the engine’s compression ratio, this one bangs out 311 horsepower and 280 pound-feet of torque (compared to 268 horsepower and 248 pound-feet of torque in the 2018 ES). The extra power, however, requires premium fuel. Lexus pairs this engine with an eight-speed automatic (six-speed automatic with all-wheel drive). This model makes an EPA-estimated 19 mpg in the city and 27 mpg on the highway. 3. It comes well-equipped, but with some individual options. The F Sport is an option package by itself, so there are no other packages to include. That said, you can find various individual options, including a heated leather-trimmed steering wheel ($150), a color heads-up display ($900) and a dynamic handling system, including dynamic rear steering ($1,700). You can also upgrade to a 17-speaker Mark Levinson Premium Surround Sound System ($1,380), choose intuitive parking assist ($500), select a power open/close trunk ($400), go with a Torsen limited-slip differential ($500) or opt for premium triple-beam LED headlamps ($1,160). Claim every option and your final price will come in at $59,825. 4. This is one display screen we like. Manufacturers have tried different ways to attach a display screen to the center stack. Some emerge from the top of the stack, while others are bolted to the upper section and look a lot like a portable device. 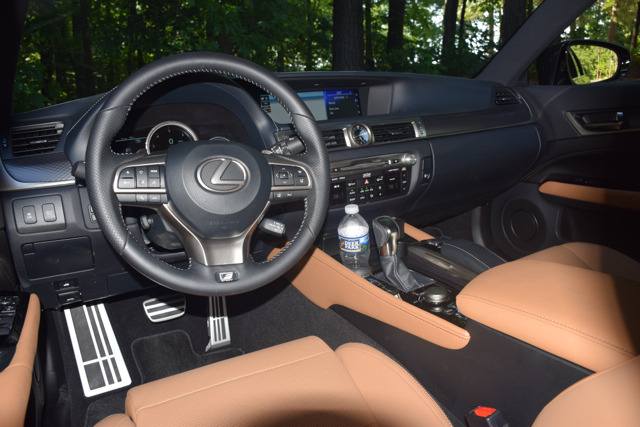 Most are fixed within the center stack and that’s what Lexus has done with the GS, but with an important twist: it resides within a sculpted alcove that pushes into the passenger section of the dashboard. This big 12.3-inch screen is clear, easy to read and unobtrusive. It also features a three-section home section display, which is customizable for audio, traffic, climate control and MID data sharing. You control it with a mouse-like device, which requires much practice before you are accustomed to it. A navigation system is standard with the F Sport and that’s a good thing. It can take over the entire display, which makes it easier to read. I like the 3D building and landmark displays. It also serves up an estimated time of arrival for your traffic routes and supplies detour information. On paper, the Lexus GS seats five and it does. But if you’re a tall driver in need of maximum room, rear passenger space suddenly becomes cramped. 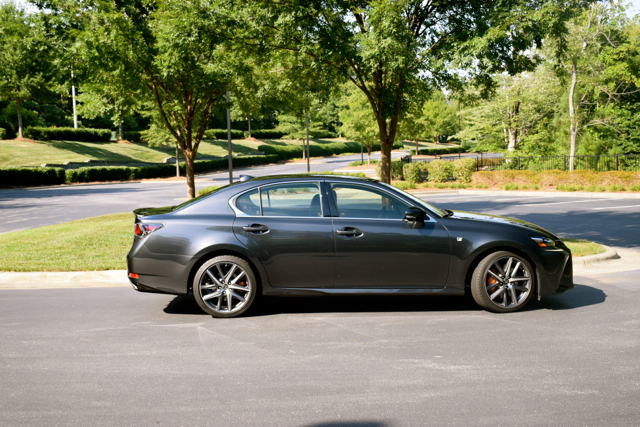 This is what sets the GS apart from the similar-sized Lexus ES. 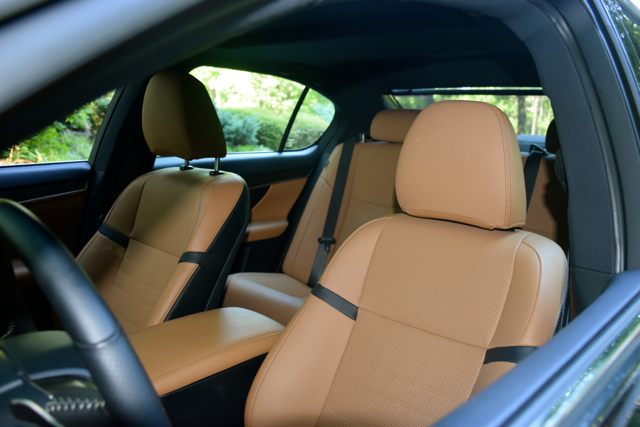 The ES has 40 inches of rear legroom to just 36.8 inches in the GS. Moreover, the GS has a pronounced drivetrain hump, while the front-wheel-drive ES has only a slightly raised reinforcing hump. This “hump” point validates why Lexus also has the ES — it is the better of the two for rear passenger space. As for trunk room, the GS offers a robust 18.4 cubic feet to the ES’ modest 15.2 cubic feet. So, there are trade-offs with each model. 6. The little things add up to something big. Manufacturers typically give me one week with a vehicle before it is replaced with something else. This timeframe isn’t very long, but it is long enough for me to do some exploring. That said, I can usually quickly identify the good and the bad (and sometimes the ugly) of a vehicle. Fortunately, “ugly” and “GS” aren’t synonymous. 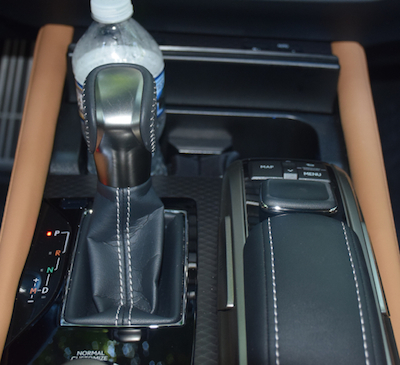 The GS has a nifty sliding armrest that locks into different positions as you open and close it. Inside are the USB ports and a place to stash your smartphone. You can easily access the phone without losing the benefit of the armrest. That’s important to drivers who sometimes face an either/or proposition. Other desirable features include the power seat extender, the power-adjustable headrests and the one-touch open moonroof. I also found the power tilt-and-telescopic steering column helpful. One missing feature is a fold-down rear seat. In its place is a center pass-through, which can be handy for holding long items such as skis or a floor lamp. 7. Safety is a priority. We’re in an era where safety is a priority across the industry. This is a good thing. What’s better is where advanced driver-assist safety equipment is supplied as standard equipment. Sadly, many manufacturers offer these features as part of an expensive package upgrade. But not so with Lexus. Indeed, the 2018 GS comes with the “Lexus Safety System+” Package. This bundle includes a pre-collision system with pedestrian detection, all-speed dynamic radar control, lane departure alert with steering assist, and intelligent high beams. There are individual safety options (see point No. 3) to enhance your driver experience, including a heads-up display and lane keep assist. Together, these tools signal Lexus’ move to autonomous drive. 8. Let’s take a look at tech. Does the Lexus GS have a weak area? Yes. That would be with its technology as you cannot find Apple CarPlay or Android Auto smartphone compatibility in any Lexus product. Word has it that Apple CarPlay will begin appearing in some Lexus products for 2019, but maybe not all. Android users will have to wait. The omission makes sense as Toyota/Lexus is being very careful that user information is not compromised through its Entune suite. Once they’re certain of that, Android should follow. What you do get is Siri Eyes Free. Again, this tool is only available with Apple smartphones. As for the standard audio package, it is a 12-speaker system, but the Mark Levinson option is simply inspiring. You need to manage your expectations when driving the GS 350 F Sport for there is a naturally aspirated V6 power under the hood. Yet, that power is more potent than the turbocharged four-cylinder engine found in GS 300 and that fact alone should leave any concern behind that the GS 350 isn’t up to the task. Acceleration is strong and constant. A 0-60 mph time of just under 6 seconds is possible. This F Sport throws down 311 horsepower and bangs out 280 pound-feet of torque. The transmission complies, serving up and switching gears as needed. Switch to Sport+ mode and begin using the paddle shifters and you’ll enjoy the full benefit of this sedan. The F Sport attacks corners with precision and hangs curves with the best of them. I mentioned to a friend that the GS is a driver’s car with all the steering, handling and stiffer ride benefits of the F Sport line. The exhaust toots and hums with that sound piped into the cabin. No, the F Sport isn’t a match for competing twin-turbo V6 models (that’s where the GS F comes in), but it supplies all the other attributes of a luxury sport sedan. 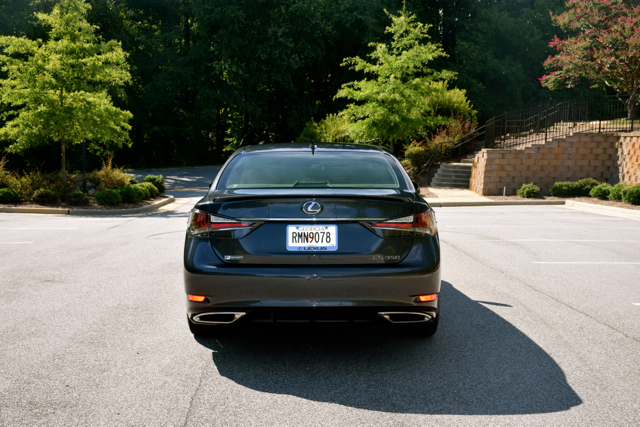 The Lexus GS 350 F Sport supplies everything it must do to earn the luxury sport sedan label. It is stylish inside and out, and the powertrain suits this sedan well. Naturally, this model isn’t a competitor to twin-turbo V6 engines in this class, so keep this point in mind. The GS F fulfills this model’s performance aspirations, but you’ll pay $30,000 more to acquire one. 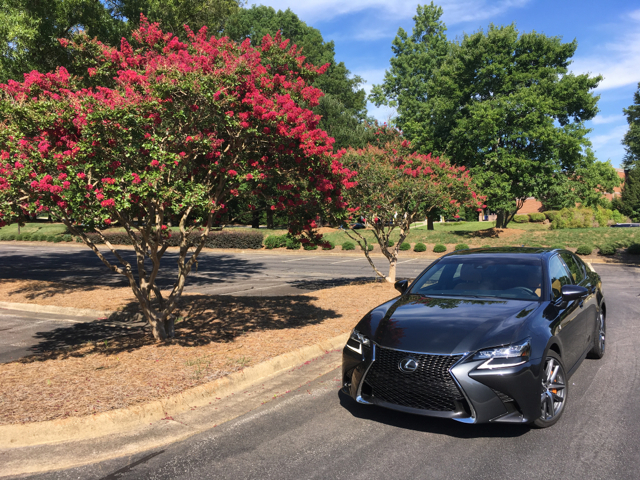 2018 Lexus GS 350 F Sport photos copyright Auto Trends Magazine.